Ultherapy uses the body's own regenerative response to gently and gradually lift skin on the lower face, eyebrow, under the chin and on the neck, and smooth lines and wrinkles on the décolletage. The FDA-cleared Ultherapy procedure has been used safely in over a million treatments worldwide. what is Ultherapy Skin Tightening and Lifting? Ultherapy is a safe, non-surgical ultrasound treatment that counteracts the effects of time and gravity on your skin. Ultherapy uses the body’s own regenerative response to gently and gradually lift skin on the lower face, eyebrow, under the chin and on the neck, and smooth lines and wrinkles on the décolletage. 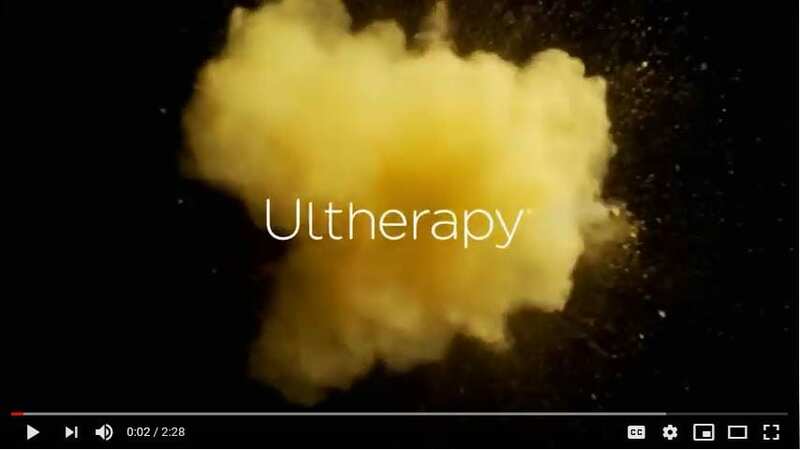 The FDA-cleared Ultherapy procedure has been used safely in over half a million treatments worldwide. Ultherapy delivers micro-focused ultrasound energy deep beneath the skin at the optimal temperature for collagen regeneration. The treatment stimulates a natural process, known as neocollagenesis, to produce fresh new collagen. Ultherapy requires no creams, fillers or toxins; depending only on the body’s own collagen-building process for natural, noticeable results. Ultherapy is the only non-invasive treatment cleared by the FDA to actually lift skin. Ultherapy is also the only cosmetic procedure to use ultrasound imaging enabling aestheticians to see the layers of tissue to be targeted during the treatment and thus ensure the energy is deposited to where it will be most beneficial. Should Ultherapy be agreed upon as the most suitable system to address your concerns, your Aesthetician will devise a bespoke programme of treatment. The length of your Ultherapy session will depend on the area being treated and your individual treatment plan; with a face and neck procedure typically taking 60-90 minutes, and brow and eye treatment approximately 30 minutes. As every client and Ultherapy procedure is unique, your aesthetician will discuss the specific expected outcomes prior to your treatment. Following treatment you may see some immediate improvement, with the optimum results achieved 3-6 months post-treatment, once the body has naturally regenerated its collagen stores. Since the procedure stimulates the body’s own collagen production, longevity of results differs from patient to patient. Most patients require just one treatment. However, based on the degree of skin laxity, the biological response to ultrasound energy and the individual’s collagen-building process, some patients benefit from additional treatments. Because skin continues to age, future touch-up treatments can help patients keep pace with the body’s natural aging process. As the ultrasound energy is delivered it is possible to feel tiny amounts of energy being deposited to precise depths, indicating that the collagen-building process has been initiated. Comfort levels vary from person to person, but the sensation only lasts for a few seconds while the ultrasound energy is being delivered. Treatment with our Ultherapy system is non-surgical, non-invasive and painless, with no down-time. Normal activities may be resumed immediately following treatment, with no need for special post-treatment measures.